This is a switched mode power pack for connections to and supplying power to the 60216, 60226 Central Station as well as the 60213-60215 Central Station and the 60175 and 60174 Boosters. Input 230 volts / 50 Hz / output 19 volts / 60 watts AC voltage or 15 volts / 50 watts DC voltage (can be switched with a slider switch). This is a tabletop switched mode power pack with authorization to be used by children. It comes in a plastic housing. The unit has mounting tabs. Dimensions 116 x 72 x 65 mm / 4-9/16" x 2-13/16" x 2-9/16". Connections: 4-pin mini DIN high current plug. The 60041 switched mode power pack is designed only for use in dry areas. Product: This is a switched mode power pack for connections to and supplying power to the 60216, 60226 Central Station as well as the 60213-60215 Central Station and the 60175 and 60174 Boosters. Input 230 volts / 50 Hz / output 19 volts / 60 watts AC voltage or 15 volts / 50 watts DC voltage (can be switched with a slider switch). 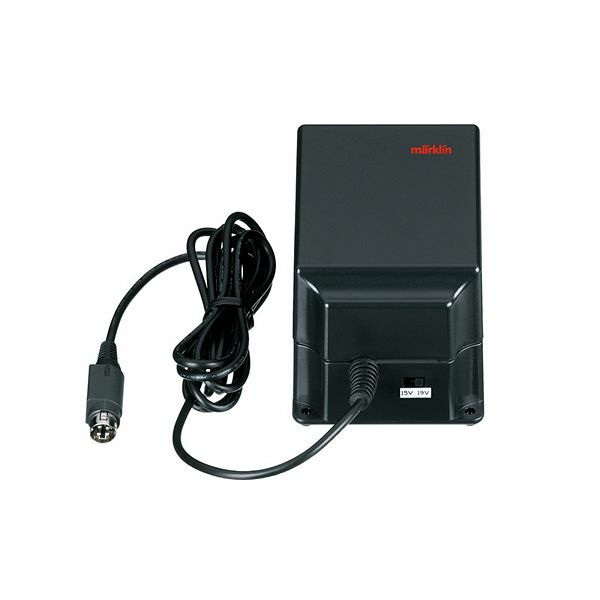 This is a tabletop switched mode power pack with authorization to be used by children. It comes in a plastic housing. The unit has mounting tabs. Dimensions 116 x 72 x 65 mm / 4-9/16" x 2-13/16" x 2-9/16". Connections: 4-pin mini DIN high current plug. The 60041 switched mode power pack is designed only for use in dry areas.